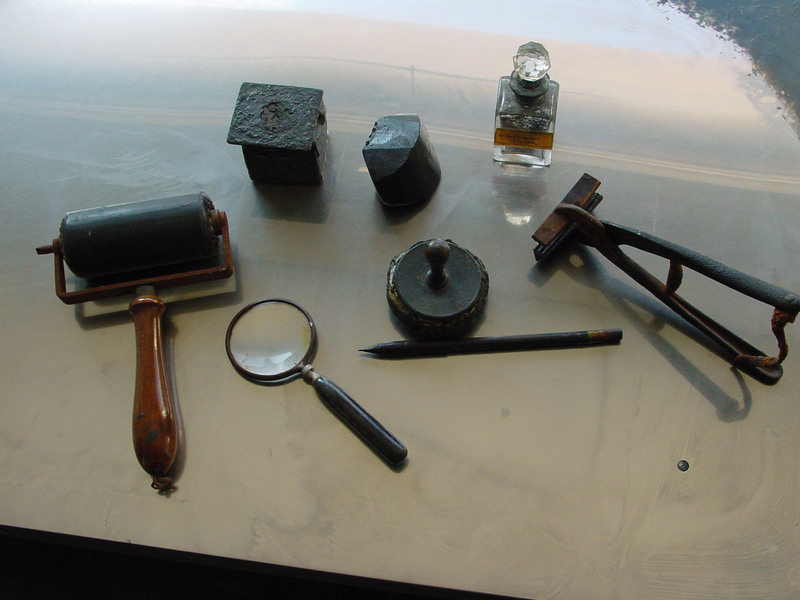 After wood engraving, copperplate engraving is the oldest graphic printing process. Even today, an original print is still closely associated with craftsmanship. Throughout the ages collectors have attached particular importance to the technique(s) used by the graphic artist (besides the artistic quality of the print). To the artist who strives for more than just a reproduction of his drawing, the material employed and its endless possibilities are a source of immense fascination. A brief historical overview shows that the old techniques of engraving and etching were constantly modified as time went by and still offer room for experimenting today. Recent findings have cast doubt on whether the older silver platelets (nielli) with which goldsmiths would decorate their gold and silverware can be regarded as the origin of copperplate engraving. These nielli featured engraved ornaments and their incisions were filled with a black melt. Goldsmiths would invariably rub a piece of absorbent paper over it before this mass was fired and melted with the metal to preserve the engraved sample as a template for further use, or for it to be passed on to other people. The paper showed a dark drawing on a light background. The oldest copperplate print on record is the “The Flagellation of Christ” by the artist known as the “Master of 1446”. This technically imperfect and artistically inexpert work was soon followed by works of greater artistic merit. The “Master of the Playing Cards”, an artist who probably worked in South-West Germany around the mid 15th century, was a notable exponent of this. The ensuing technical and artistic development of copperplate engraving was extremely rapid. Martin Schongauer (1453-1491) and Albrecht Dürer (1471-1528) finally brought it to a pinnacle of perfection that was never to be matched again. With the advent of etching, copperplate engraving was reduced mainly to a “means of image reproduction”, not unlike steel engraving later on. As a young man Albrecht Dürer’s work with this young art form was greatly influenced by Martin Schongauer and the Italian copperplate engraver Mantegna (1431-1508). Dürer then became a role model for Dutch and Italian engravers. He also created five iron etchings. These etchings can be traced back to armorers, who used etched ornaments to decorate armor and weapons. After Dürer, etching progressed very rapidly, with copperplate soon replacing iron (which rusted quickly). The Dutchman Hercules Seghers (ca. 1589-1639) loved experimenting. Some of his etchings are printed on colored paper. In addition to black as the printing color, he also used different colors or shaded the print with gouache pigments. In places he would leave the plate hue to enhance the artistic effect. His works served as a model for Rembrandt, whose own works with his particular technique are still of great interest to etchers today. In the baroque period many artists turned etching into a virtuoso art form. The illusionistic approach helped etching progress beyond the previously sober description of shape and adopt the means of expression particular to painting, transforming them into graphical portrayals. In this period Rembrandt (1606-1669) was without doubt the artist who best exploited the technical possibilities of etching, giving them priority over artistic considerations. Ever since the 17th century frequent attempts have been made to print copperplate engravings and etchings in color. With the exception of the English mezzotint prints of the 18th century, such attempts were less than satisfactory. The mezzotint technique, a development of copperplate engraving which enabled surfaces to be covered for the first time, was invented by Heinrich von Siegen in 1640. The graphical works of Francisco Goya (1746-1828) in the 18th century reached new artistic heights. Goya perfected the aquatint process, a large-surface technique using acid. The immediacy and power of expression of his aquatint prints are exemplary, not least due to his mastery of the method. The first multicolor prints à la poupée were also created in Paris. In this process the various color tones are rubbed directly onto only one or at the most two plates using small dabbers; only one or two stages are necessary – a form of color etching. The 17th and 18th centuries brought us the peintre graveur or “painter engraver”, i.e. the artist was designer, engraver or etcher, and often printer all in one. Schongauer, Dürer, Seghers, Rembrandt, and many others were peintres graveurs. The beginning of the 19th century saw the arrival in England of steel engraving, which, thanks to the hardness of the material, meant that far more impressions could be printed than with copperplate engraving. This technique was used primarily for illustrations, fashion designs and the like. In the 19th century few artists regarded etching as an artistic means. Today works created in this period are held to have very little artistic significance. The invention of photography in the mid 19th century made new and simpler methods of image reproduction possible. It was not until the end of the 19th century that artists such as Max Klinger and Max Liebermann rediscovered the artistic possibilities of etching. Like many other artists of their time, Edvard Munch (1863-1944), Max Beckmann (1884-1950) and Emil Nolde (1867-1956) studied the etching method in depth, using lines and surfaces to lend their works powerful expression . In his etchings, Picasso (1881-1973) employed the sugar technique – among other things – which he was prompted to use by Lacourière and his etching studio. The charm of these prints lies in the application of the brushstrokes directly to the plate. Luigi Kasimir (1887-1962) and Josef Eidenberger (1899-1991) round off the circle of contemporary acknowledged grand masters of color etching. Both Kasimir and Eidenberger took the color etching technique to new heights of perfection. Soft, gentle strokes mixed with aquatint result in a picture which closely resembles a painting in terms of expression.